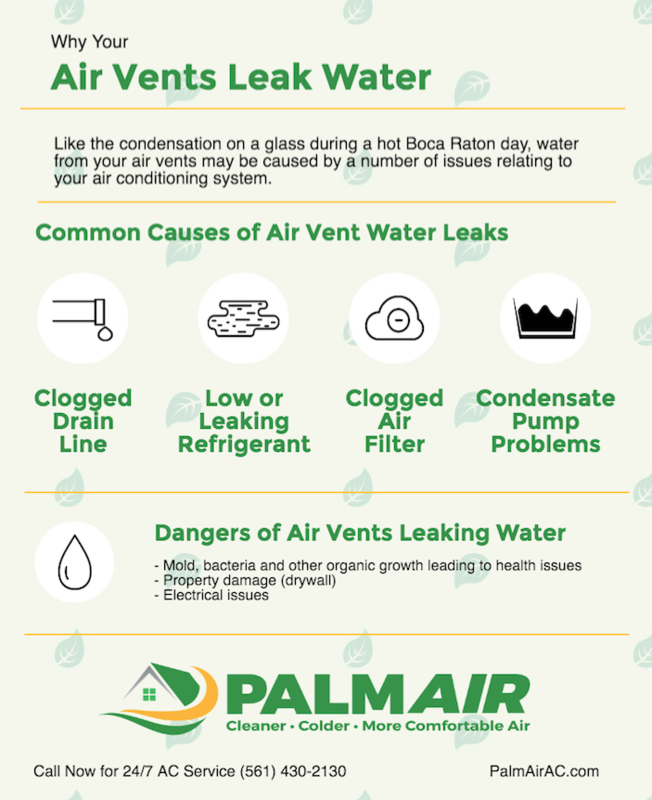 Like the condensation on a glass during a hot Boca Raton day, water leaking from your air vents may be caused by a number of issues relating to your air conditioning system. While condensation on a glass usually does not harm anything but maybe a nice wooden table with no coasters, water leaks in the ductwork of a home can create serious issues. Do your air vents leak water causing concern that you may need emergency AC repair? Please do not hesitate to call our team of certified AC technicians to inspect. It could be or create a more dangerous issue in your home. Contact Palm Air Air Conditioning now for your home in Broward and Palm Beach counties, including Delray Beach, Deerfield Beach and Fort Lauderdale.